free market | Oh Happy Dae! 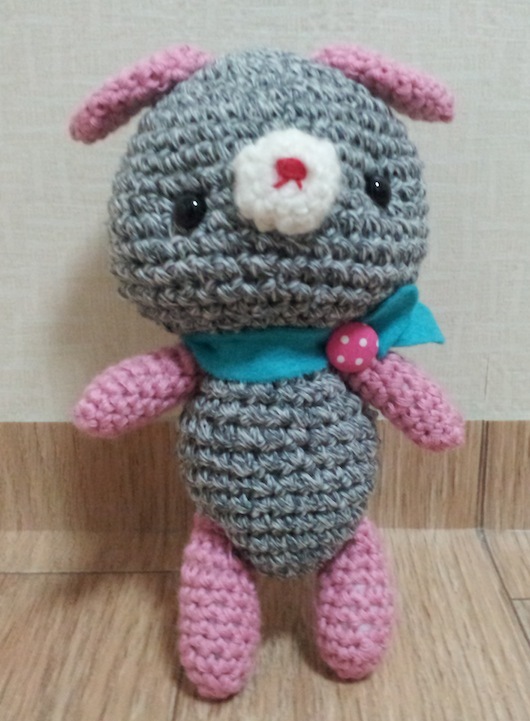 Posted in art, photos, Seoul, shopping	by Oh Happy Dae! I found out about it just doing a quick search for “things to do in Hongdae” on Google. 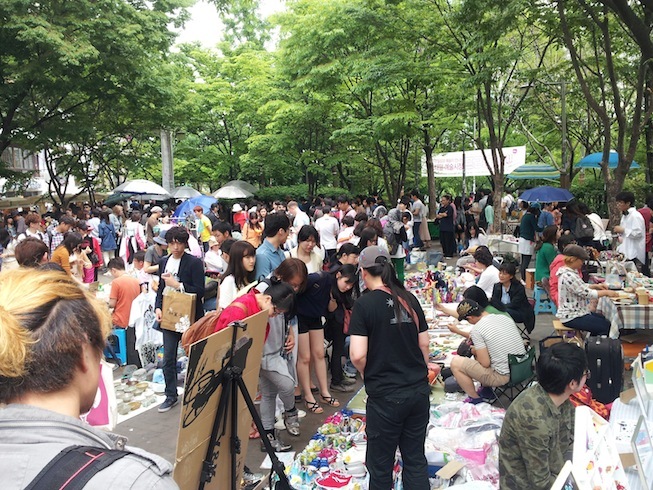 The Free Market is basically an open air market set up in a park for local artists to sell their wares. Since my major was Fine Arts and I love making crafts I was excited to check it out. The market is every Saturday from March until November from 1 pm – 5 pm. 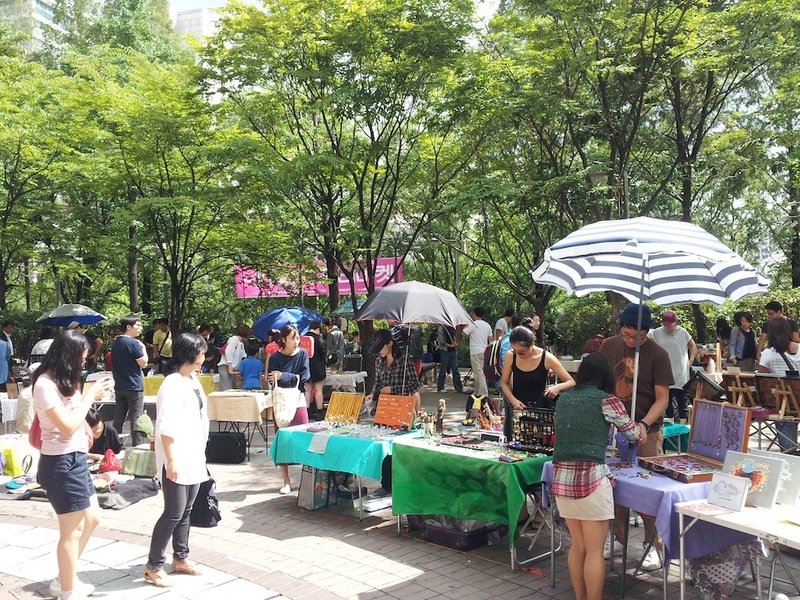 It’s held at Hongik Children’s Park, right across the street from Hongik University, so it’s not hard to find. It was a great day to go. The weather was warm and the sun was shining. Just the right weather for admiring art and dropping some cash. 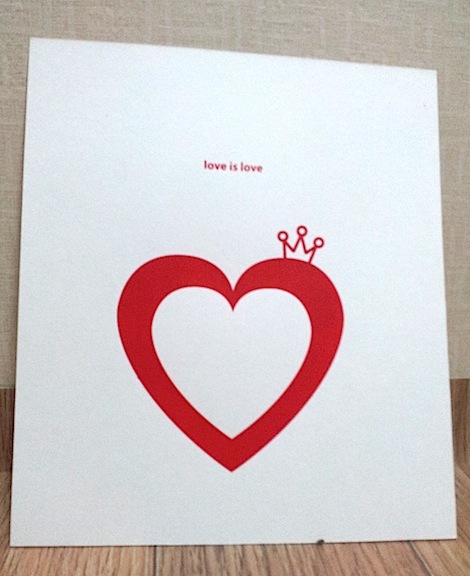 This was my first purchase of the day (and the vendor’s first sale of the day as well). 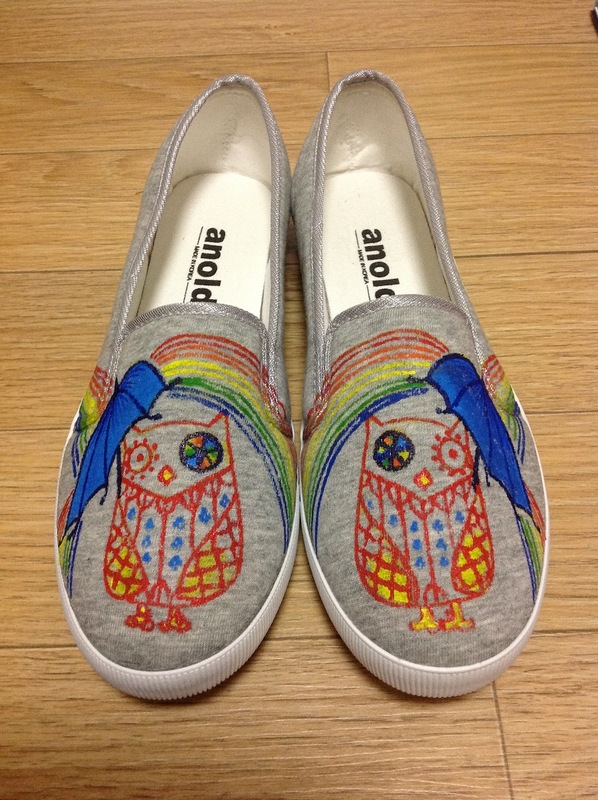 She said she came from California, and she was selling a variety of hand-painted shoes. I love the bright colors, and they’re actually pretty comfy! If you wanna check out her stuff she has a website – www.slow2go2.com. I couldn’t resist these. 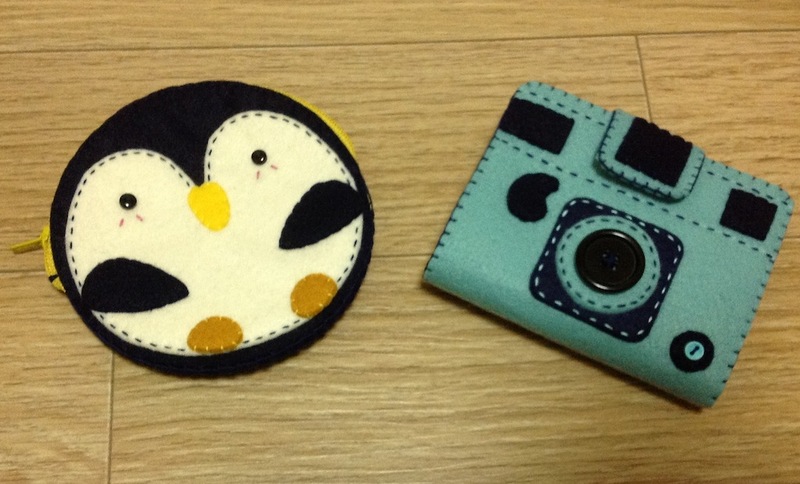 The penguin is one of my favorite animals, so I grabbed this coin purse. 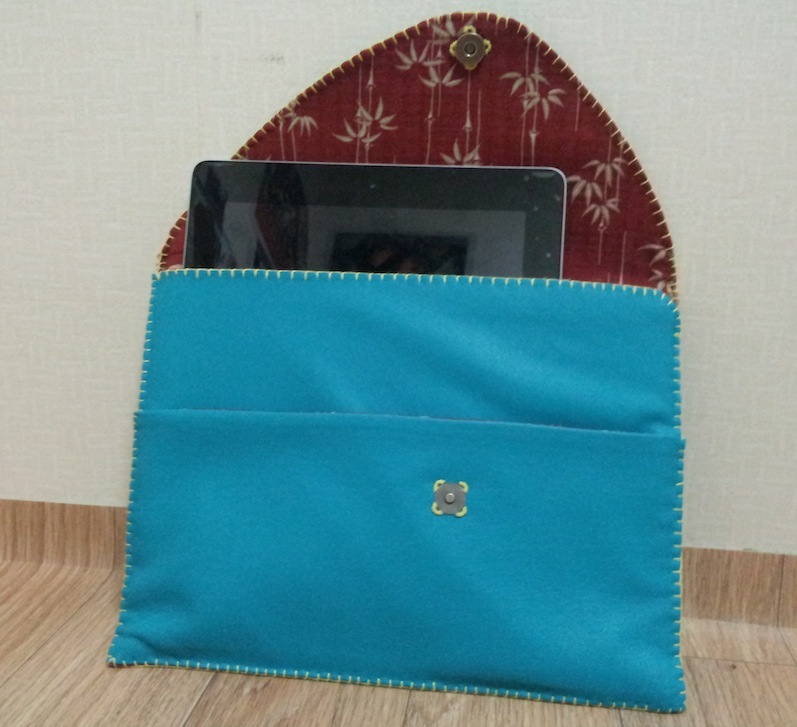 It’s also big enough to hold cards. The camera is a neat little wallet. Both are made from felt and very sturdy. 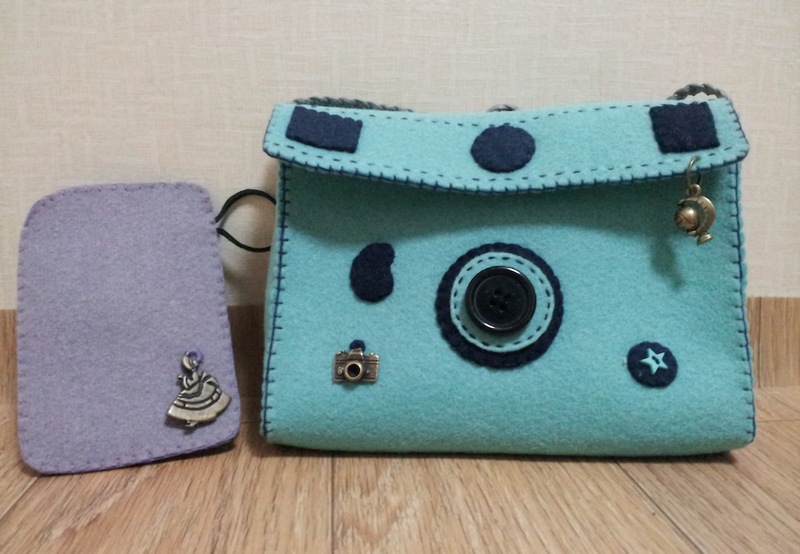 The coin purse was 10,000 won and the wallet was 12,000. 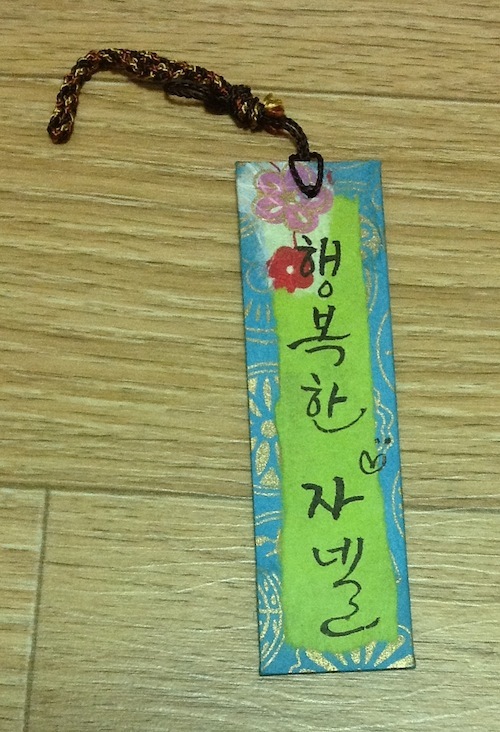 There was a woman at a table doing calligraphy on various bookmarks and cell phone straps. Turns out she teaches calligraphy to foreigners in Seoul. If I lived up there I’d love to go for lessons. Alas! I’m a bit too far south. 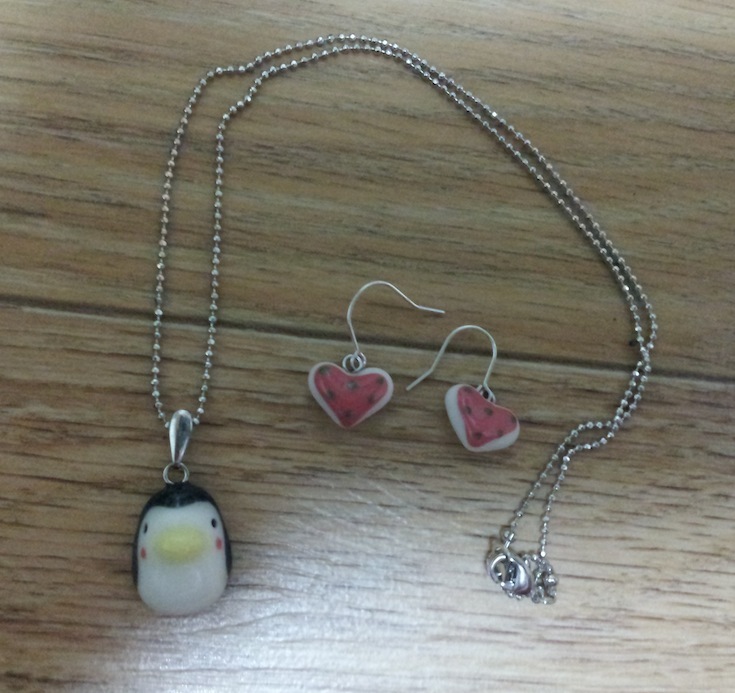 But if you’re curious, go check out her blog – Boot Touch 붓터치. 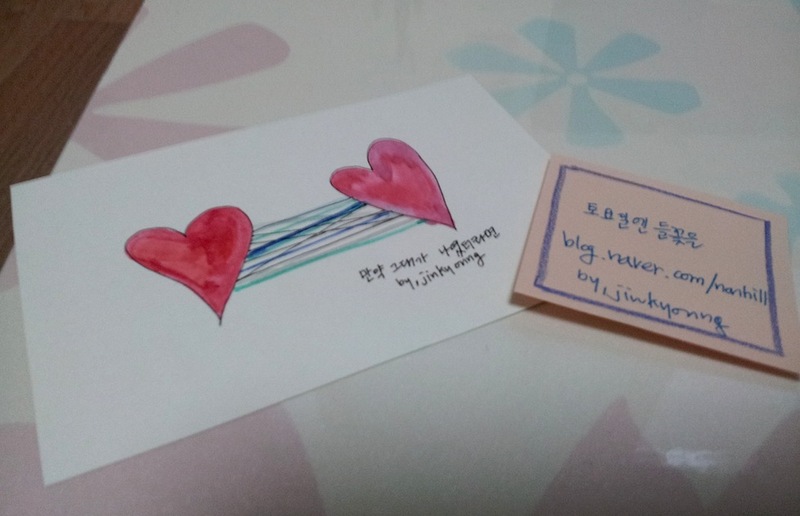 I bought a bookmark and asked her to write “happy Janelle” in Korean. 🙂 I also bought a cell phone strap for a friend. They were only about 3,000-4,000 each. 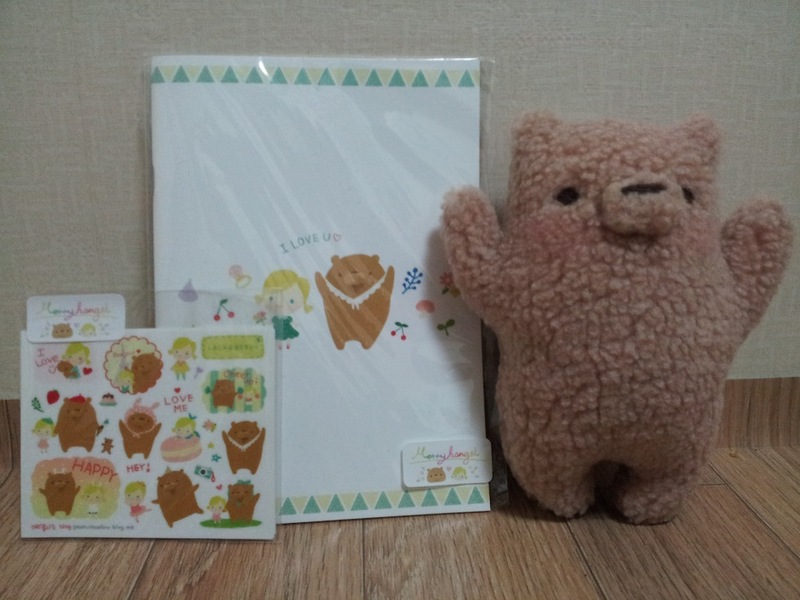 They’re very cute and inexpensive gifts. There was another woman who had lovely jewelry. 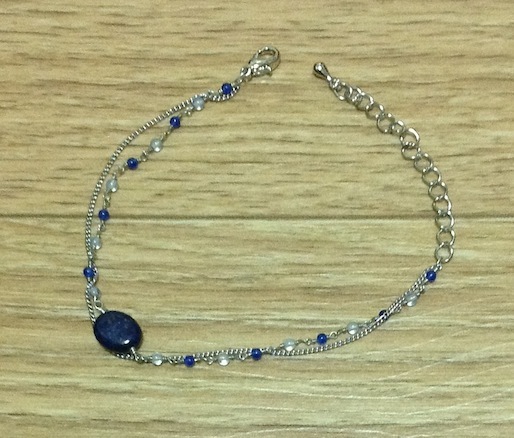 I chose this bracelet made with lapis lazuli. 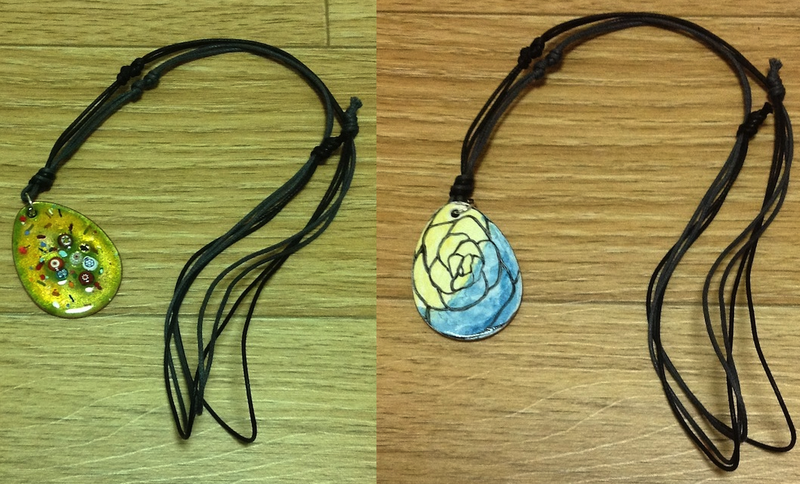 This is another fun purchase – a double-sided necklace. 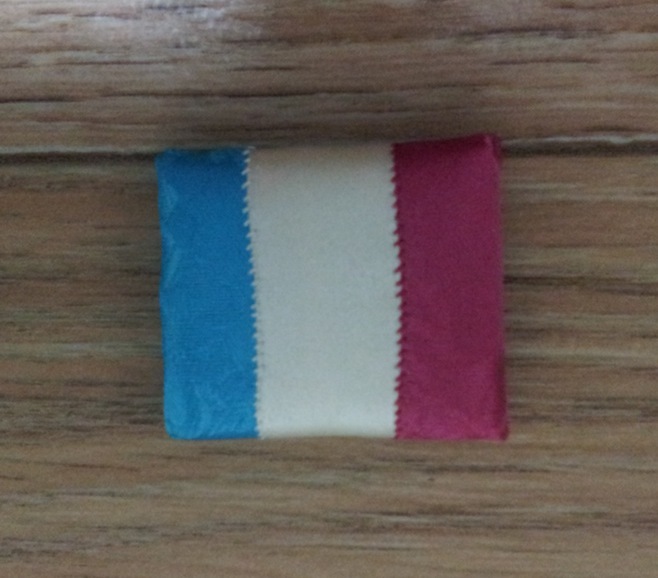 One side has the colorful glass and the other is the flat 2-toned rose. 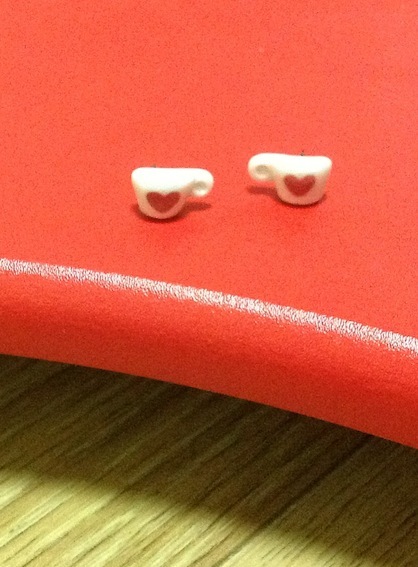 The last thing I bought were these cute coffee cup earrings. I don’t drink a lot of coffee, but I couldn’t resists these. 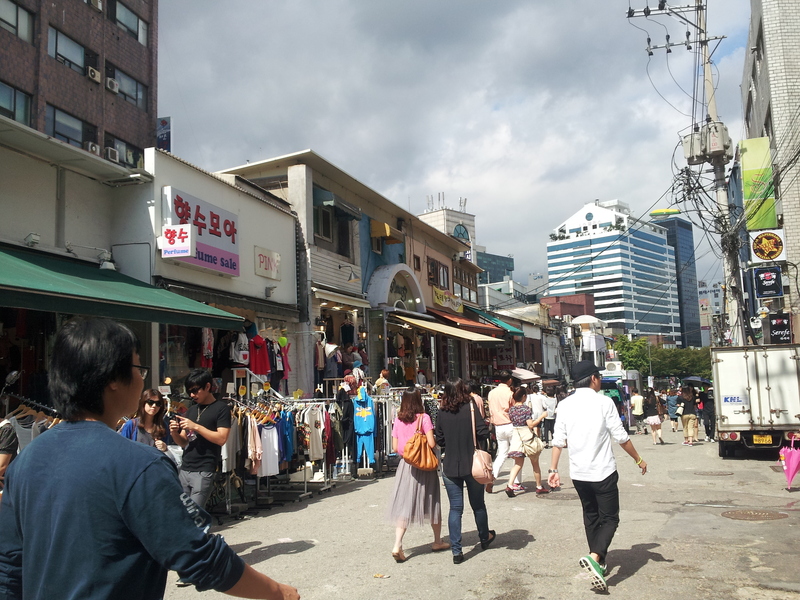 If you’re looking to hit up the market too, it’s just a short walk from Hongik station. Go out exit 9 and walk straight until the 1st intersection. 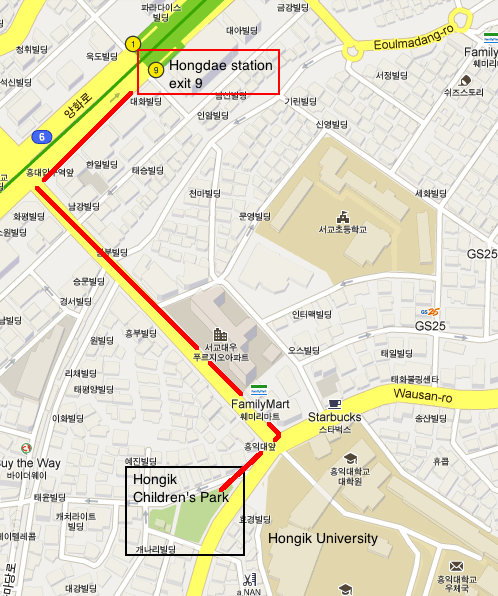 Turn left and walk straight up the hill towards Hongik University. When you get to the end, right in front of the uni, turn right. The park is just around the corner on the right side. You can walk up some stairs or take the side street. My advice is, if you like these sorts of things, take enough cash. However, if you run out there’s an ATM conveniently outside one of the nearby stores. 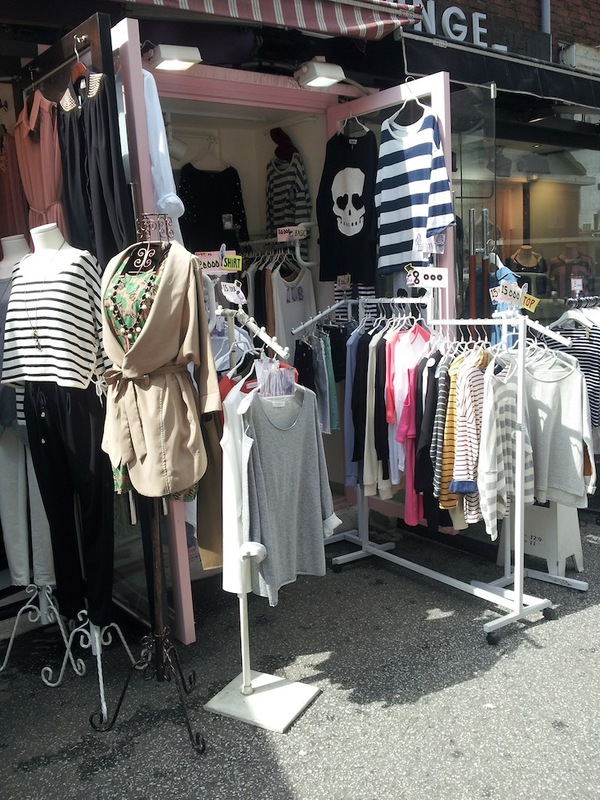 One of many streets with plenty of fashion to look at. A lot of the prices are low, so it’s hard to resists sometimes. 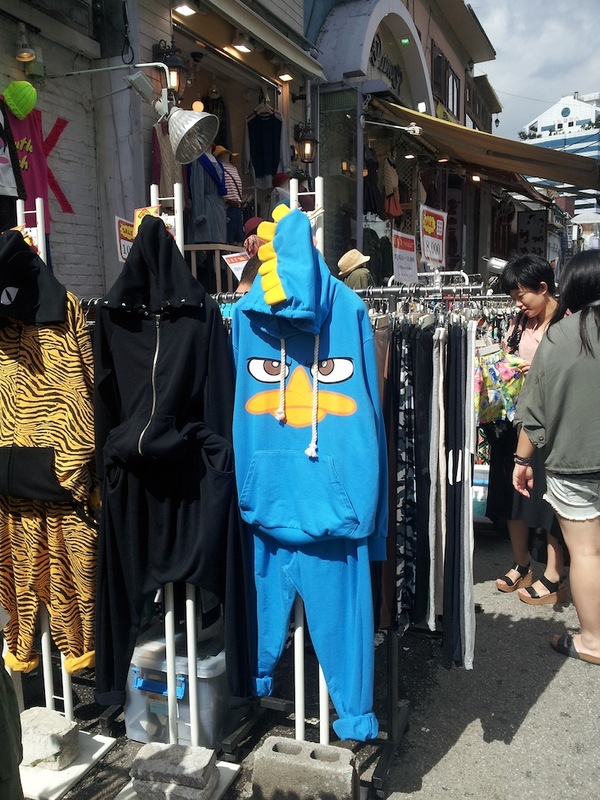 I’m curious how one might be part of the market. I make accessories mostly for fun; however, most of the stuff I’ve made lately is just sitting in my craft basket. I may want to find a way to sell them. I suppose that’s one of my next missions!